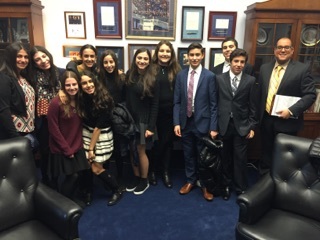 On Monday, November 30th, a group of 45 Yeshivah of Flatbush students from our Israel Activism commission headed to Washington, D.C., our nation's capital. With growing fear of the terrorist attacks daily taking place in Israel, we decided to take action and have our voices heard. 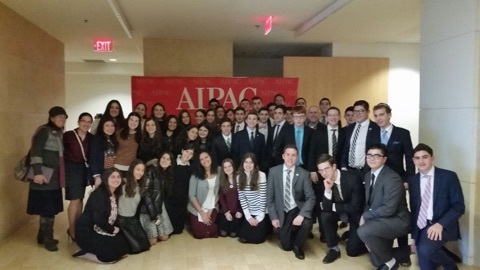 After minyan at around 6am, we headed straight for AIPAC, American Israel Public Affairs Committee's headquarters in D.C. With the help of Sydney Kaplan, AIPAC's high school director, we educated ourselves with knowledge of the situation in Israel and America's involvement for months in preparation for our scheduled lobbying meetings with our New York representatives. AIPAC's representative, Erica Miller, met with us in their executive boardroom overlooking a beautiful view of the Capitol building. She spoke to us about our lobbying meetings: how to act, what to say, how to say it, what to ask, what to focus on, etc. Then, professional legislative assistant Daniel Bleiberg reviewed all of our talking points and worked with us to practice what we planned to say to our representatives. We drove to capitol hill and split up into our lobbying groups, meeting with Senator Schumer and Congress members Clarke, King, and Velázquez on behalf of the Jewish community of Brooklyn and Yeshivah of Flatbush. The Congress members that we met with are all representatives of New York districts where students and teachers of Yeshivah Flatbush live. I went to Yvette Clarke (district 9, Flatbush area). 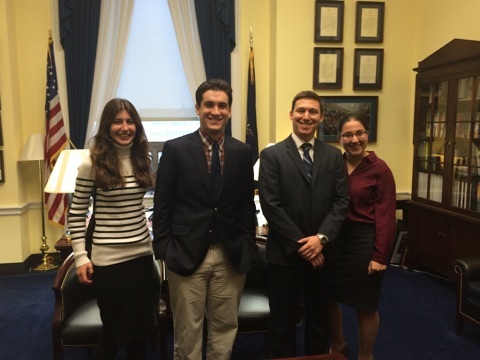 We met with her legislative assistant of foreign affairs, Adam Abramson. He really listened to us as well as the intern that he brought with him. We thanked him for the Congresswoman Clarke's support of the U.S.-Israel relationship and for signing onto specific bills and acts in support for Israel that we mentioned. We spoke deeply about each issue that we wanted to discuss including the rising terror wave in Israel, the tension on the northern border of Israel, and the importance of maintaining the U.S.-Israel relationship. We connected our personal experiences in Israel. Adding passion to our cause, we told Abramson the reasons why we care for Israel. We asked him what America and he can do to combat the terror. He responded reassuringly, saying that he will constantly help the cause. In addition, we introduced that it's in the United States' interests to support Israel's security needs, considering that Israel is the United States' only committed ally in the Middle East region. Abramson believes that Israel will always be in U.S.'s budget due to the shared values between Israel and America, reassuring us that he would make sure of it. It was an extremely educating experience for myself and especially for the students in our school. We learned so much in these past few months and an incredible amount on this trip. 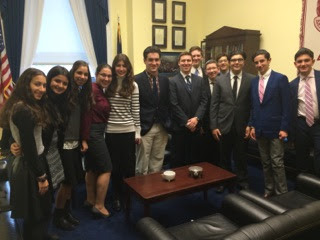 We used the information that we learned to stand up for Israel on capitol hill and get their voices heard by representatives that have influence in the government. We are able to speak for Israel extremely confidently now because we understand the facts of the conflicts and believe in the importance of it all. This trip was very effective! Representative Adam Abramson remembered me well from past meetings I've had with him, which was great because he told us all to contact him in the future about Israel so that he can continue to hear our viewpoints and represent us. We anticipate maintaining the relationships we initiated with our representatives. After our meetings, our four groups met up for a guided tour of the Capitol building! This was a very educational and effective lobbying mission, and couldn't have taken place without Yeshivah of Flatbush's supportive administration! We hope to continue speaking out for Israel! Am Yisrael Chai!! !